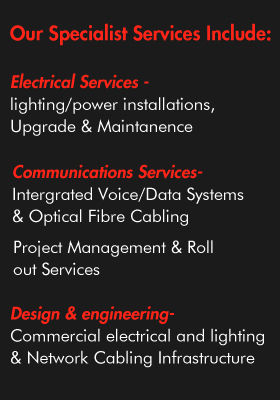 R W Palmer Electrical Service will commit to a range of services, solutions, roll-outs and project jobs within time specifications and within budget, underpinned by a service philosophy that aims to exceed client expectations and relieve the pressures of time and complexity, on time - the first time. Focusing on a long term commitment to our clients, and their requirements. The depth of our skill base and experience is one of which we can be justifiable proud. With a vast range of knowledge and experience, trained, qualified, multi-skilled, and specialists personnel in all areas of our service offerings, the R W Palmer Electrical Service Project Managers, Technicians, Administration staff and Managerial team deliver on our client's expectations consistently. Continual training in the latest technologies, equipment and policies. A Technological yet personal approach to service. Our efficient service team provides on-going support and reliable service. Our business has been built on its reputation through repeat business and referrals. Building business partnerships in the truest sense. Our highly skilled staff members pride themselves on a ?no call back? philosophy which means on time, the first time and within the agreed scope as agreed with our clients prior to commencing any works.